Airbus has unveiled plans to upgrade the world’s biggest passenger jet, promising greater fuel efficiency and room for more seats. 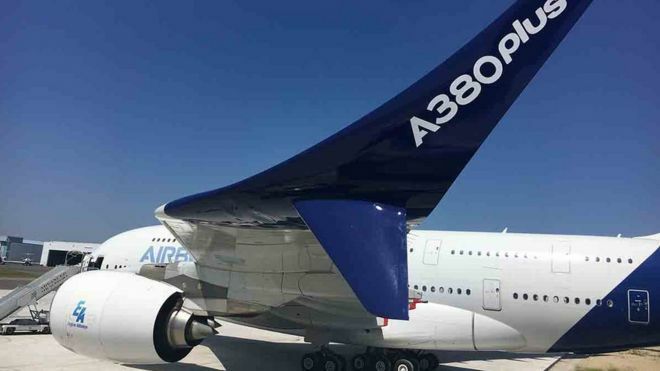 The A380Plus, which was announced ahead of the Paris Airshow, will boast a new wing design intended to improve aerodynamics. Airbus also said the cabin had been optimised to allow up to 80 extra seats “with no compromise on comfort”. The move has been seen as way of boosting flagging sales of the A380. There has been a dearth of orders for the plane as more airlines opt for smaller twin-engine jets, which cost less to fly and maintain. The European plane maker said the new version would burn up to 4% less fuel thanks to its new winglets, which are designed to reduce drag. It will also have an increased maximum take-off weight and need less regular maintenance checks. Airbus said that along with other enhancements, the plane would cut costs for airlines by 13% per seat. Sales chief John Leahy said the plane would offer “better economics and improved operational performance”.